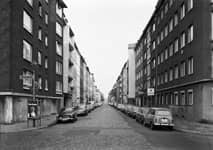 Thomas Struth began to study at the Kunstakademie Düsseldorf in the autumn of 1973, entering into Gerhard Richter’s class in 1974. 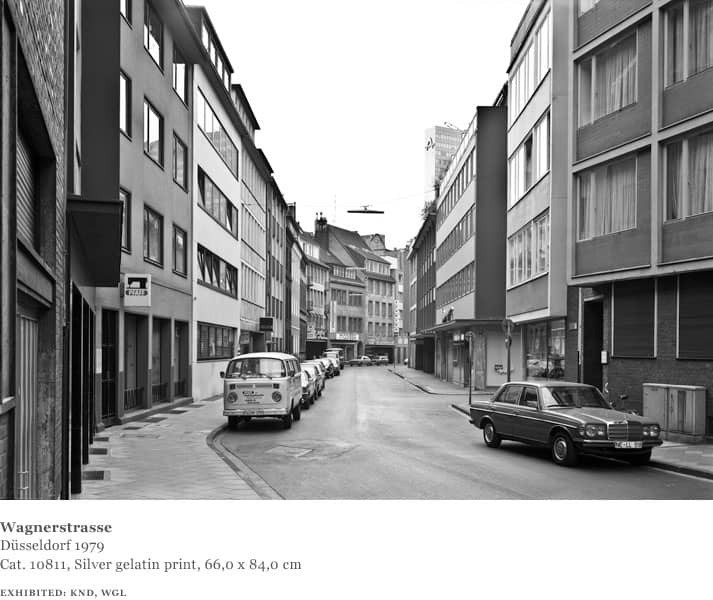 Initially Struth was interested in photography as a source for his paintings. 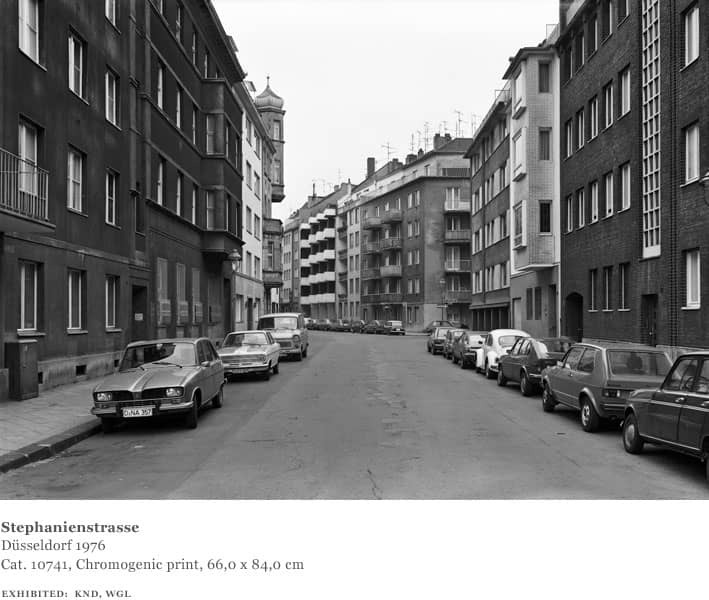 In order to learn more about the different possibilities of the medium, he made some experiments photographing passersby in the street with different exposures and compositions, using a 35mm camera. 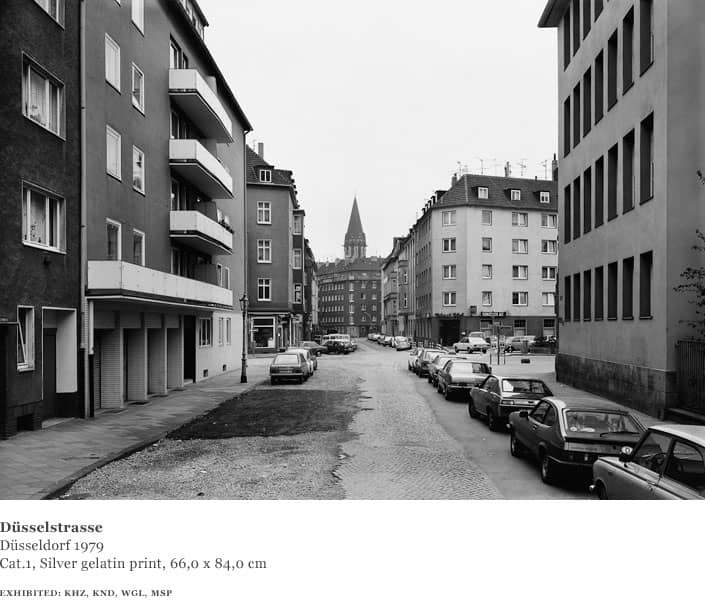 The city functioned as an architectural backdrop for photographing the individual figure. 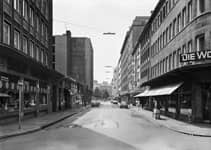 The idea, Struth recalls, was to some extent influenced by the sculptures of George Segal, which he had seen at the Museum Ludwig in Cologne, and Giorgio de Chirico’s metaphysical paintings of imaginary urban spaces. 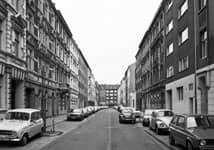 Each year, students at the Kunstakademie Düsseldorf presented a body of new work in an exhibition called the Rundgang. 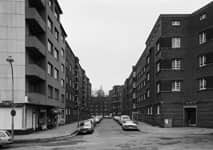 For the exhibition in February 1976, Struth decided to shift the focus of the photographic work and concentrate on the street itself rather than the figure within an urban context. 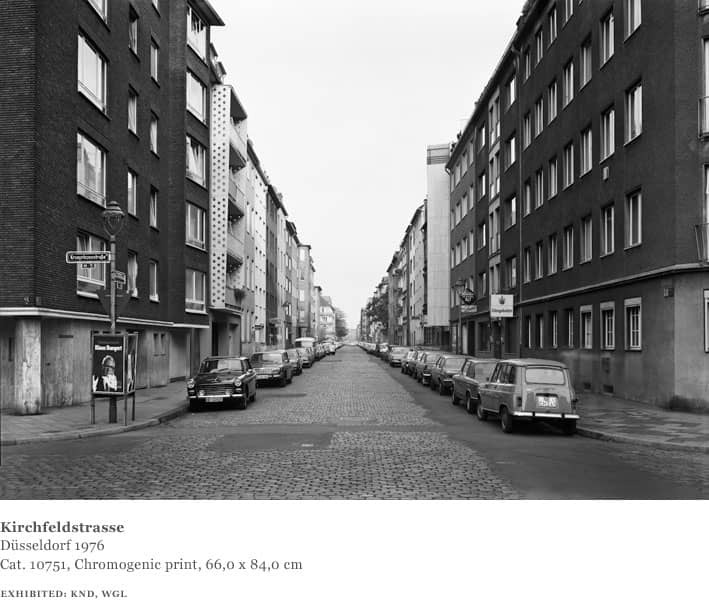 He made a grid comprising forty-nine photographs of streets in Düsseldorf, seven by seven, each photograph structured around a central perspective. 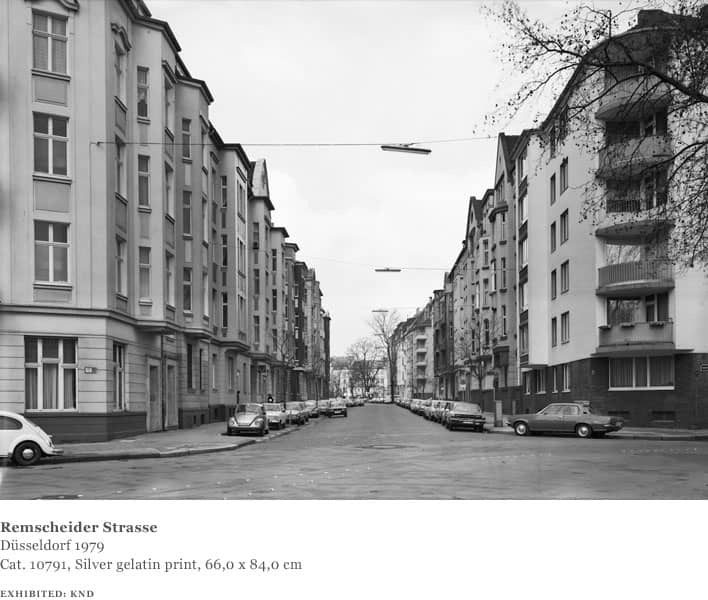 Struth photographed streets all over Düsseldorf, working on weekends and always with the camera placed on a tripod in the middle of the street. 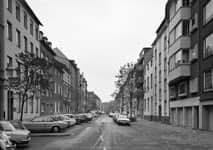 It was important to Struth that the photographs were a systematic documentation of ordinary streets in an unremarkable, reconstructed German city rather than the result of personal selection. Struth’s knowledge of photography at this stage was limited to books, magazines and occasional encounters in museums with the work of artists using the photographic medium. 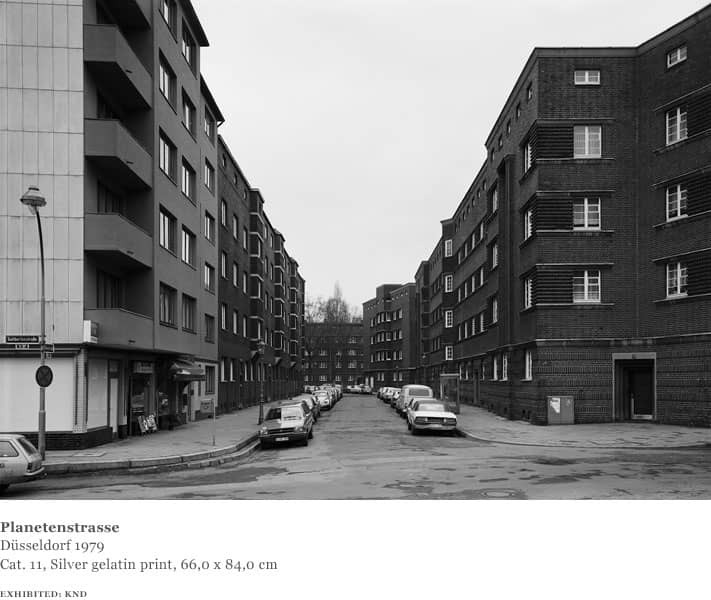 For the most part, however, these artists renounced traditional pictorial qualities and used the medium in a casual, informal or amateurish way, such as Ed Ruscha’s books or Christian Boltanski’s collections of apparently archival material. 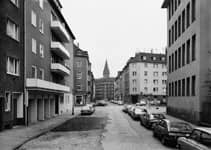 On occasion Struth was asked by Gerhard Richter to work in his studio, for example to assist in the preparation for a presentation of Atlas at the Museum Haus Lange in Krefeld. 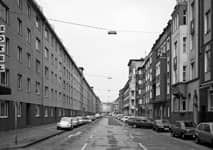 Struth remembers “piles of cheap photographic prints in the studio, which I glued on cardboard to be framed, piles of images of seascapes, flowers, icebergs. 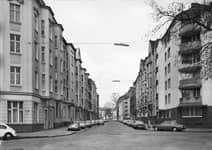 It was an important encounter with a certain kind of conceptual thinking.” At the same time Struth was also collecting postcards, for example of Cologne Cathedral, analysing the variations in different postcards of the same view—the colour, the clouds, the different camera positions. 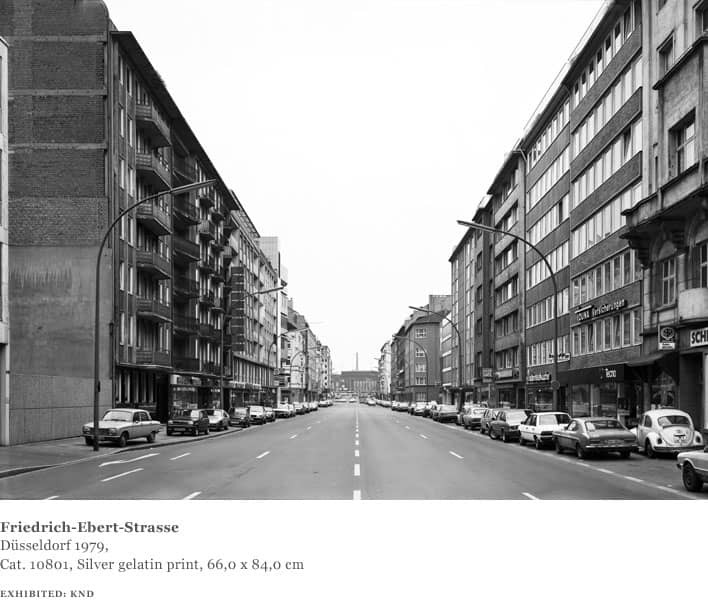 The presentation of the grid of forty-nine Düsseldorf street photographs came at the end of Struth’s period studying in Richter’s class at the Academy. 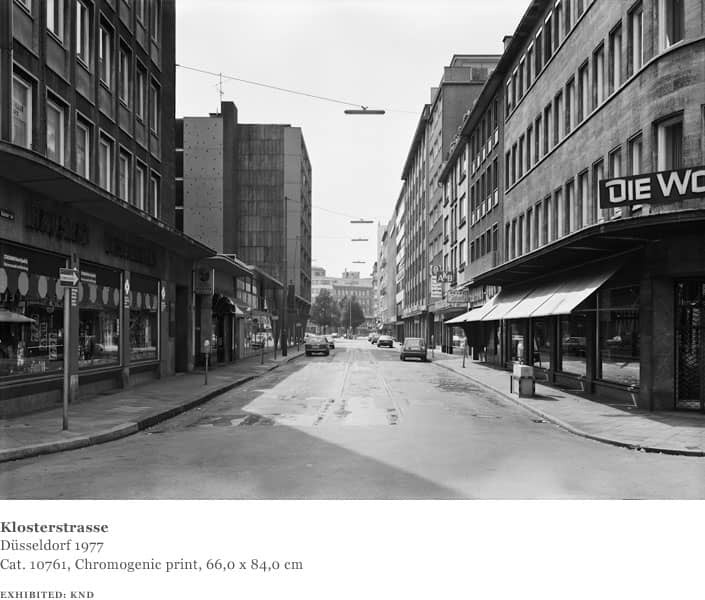 At this time, he had the uncomfortable feeling that, as he was no longer making paintings, Richter’s class was no longer “the right place to be.” After the vacation, Richter brought the dilemma to a head by telling Struth that Bernd Becher was to become the newly appointed professor of photography at the Academy. 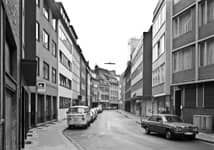 He had never heard of the Bechers or seen their work. 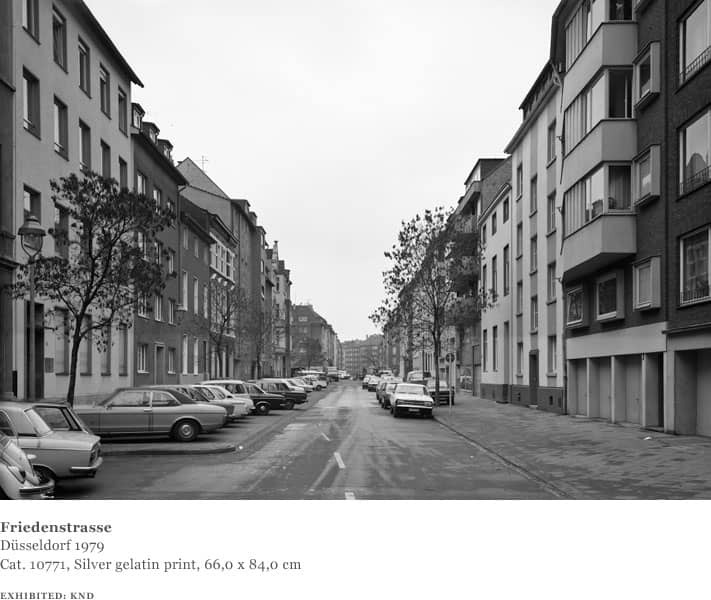 At their first meeting, Struth showed Becher the Düsseldorf street photographs, and also discussed research he had done on architectural representation over ten years in the magazine Der Spiegel. 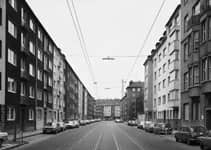 Struth was accepted as one of the first small group of students, together with Candida Höfer, Axel Hütte and Roswitha Ronkholz, to study with Bernd Becher. 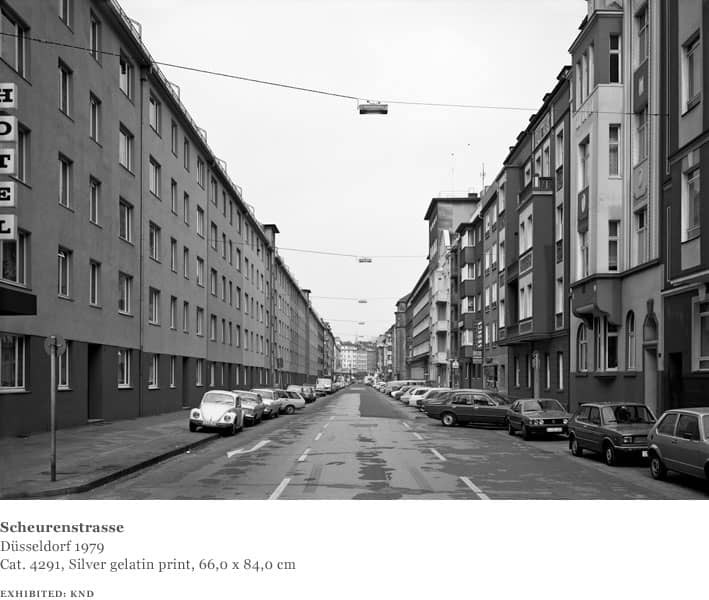 Bernd Becher encouraged Struth to explore the possibilities of working with a different format camera. 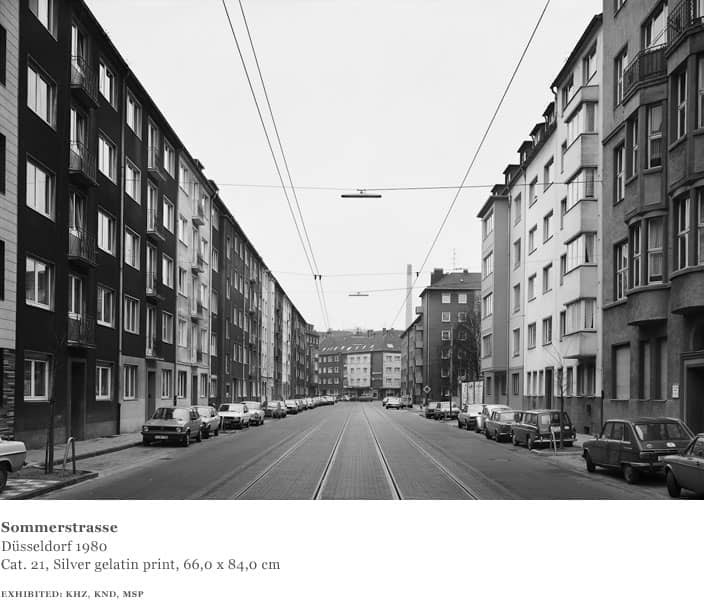 He suggested a 6 x 9 camera might help both the compo- sition and sharpness of the image. 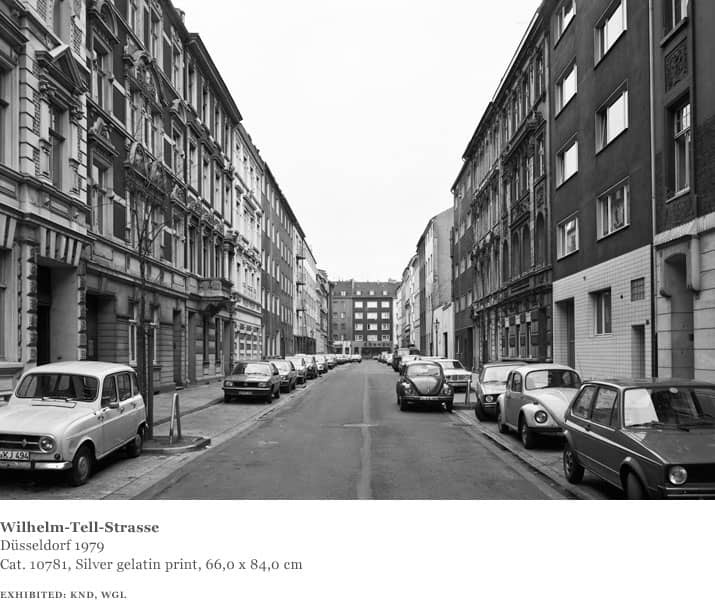 Struth resumed his project of photographing the streets of Düsseldorf with renewed enthusiasm. 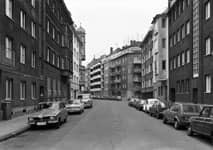 He continued to use the organising device of the central perspective but now became more attentive to the subject as well as the photographic means at his disposal. 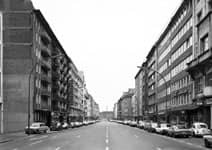 Between the summer of 1976 and the summer of 1977, he photographed some three hundred streets in Düsseldorf with a large-format 13 x 18 camera.